This durable Listening Center connects expands classroom learning opportunities. 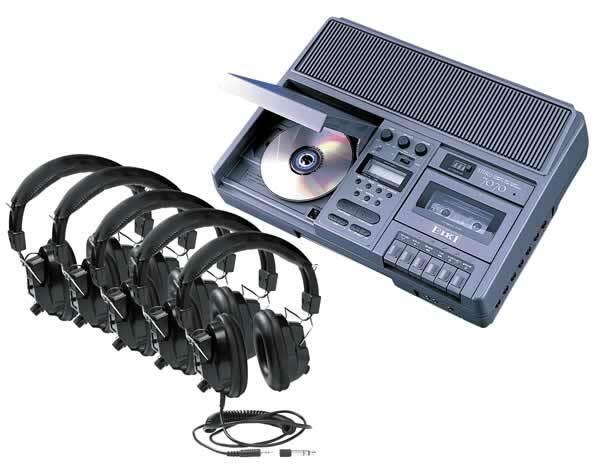 Its rugged and dependable headphones and CD/cassette player/recorder are constructed for individual and group learning applications. • The Eiki 8080A features a USB recorder that can play MP3 and WMA files stored on a connected USB flash drive. • It can also convert music from a CD or cassette tape into MP3 format and records it directly onto a connected USB flash drive. • CD Deck features 21-track programmable CD memory. • Includes 1/8” microphone and auxiliary jacks, five 1/4” stereo jacks, and two 1/4” external speaker jacks.